With none of the players still out on the course currently threatening the top of the leaderboard, now is the perfect time to sit back and watch the highlights from a great day of golf on BBC Two right now. Press the play button at the top of this page and enjoy. We will end the live text for today there, so thank you for all your great pictures and comments. We will be back nice and early at about 6.15 BST on Friday morning for day two of the Open Championship. Bye for now. We mentioned Miguel Angel Jimenez's moment of brilliance on the 16th during his level par round at Royal Troon. And now, you can watch his eagle with this video below. Will this be the time Sergio Garcia wins his first major? He will start round two tomorrow inside the top 20 after a score of three under, but he does not sound too thrilled with his performance. "I've been looking forward to it a lot and every knows that after the Ryder Cup this is my favourite event," Garcia tells Sky Sports. "My swing didn't feel very good, but I'm very happy with the end result. I struggled in the first couple of days of practice and started well and hit a few good shots, but was then fighting with it. I managed to put together a decent score." World number 93 Yuka Ikeda is also done for Thursday, and he so nearly finished in style, but saw a 30 foot putt for birdie just miss. Nevertheless, it has been a great day for the Japanese player, who will be delighted with a three-under-par round of 68. He has never finished inside the top 20 of a major, but is tied 12th at the moment. Good effort. Spain's Miguel Angel Jimenez carded a 71 but it was the 52-year-old's eagle on the par five 16th that stood out. After chipping in, he did a shuffle and then dofted his cap. He may be 52, but he still has got some great moves. Some quotes from the 2015 champion Zach Johnson, who carded a round of four under, despite ending with bogeys at both the 17th and 18th. "It's not exactly how I wanted it to end today, but I played very solidly," Johnson tells Sky Sports. "At the end I played two errant shots on the 17th and 18th and I didn't make the putts, but I did make a lot of putts earlier on. "The best thing (about being Open champion) is having the Claret Jug. That thing is fantastic and I was in awe of it. It's a very special piece of silverware - one that family, friends and strangers all embraced. "I would love to have that opportunity again and I'm excited for what lies ahead." The crowd shout 'go, go' as Sergio Garcia's long-range attempt for a birdie on the 18th is on its way. But the fans are left disappointed as it comes up short. Nevertheless, he is still well placed with a three under round of 68. Keegan Bradley is also done, a four under round for him, with the only blemish being a bogey on the 13th. 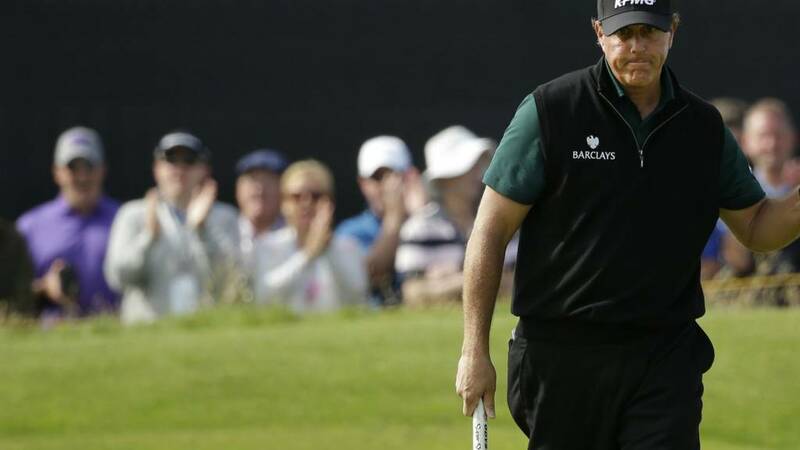 Phil Mickelson’s playing partner Lee Westwood is well used to playing a supporting role this year, having partnered both the Masters and US Open winners on the final day. And he almost witnessed history being made when Mickelson’s putt agonisingly lipped out on 18. English golf's nearly man Lee Westwood made a late comeback at Royal Troon to card a level-par 71, having been three-over par after 11. You can watch full highlights from day one at The Open at 20:00 BST on BBC Two with Hazel Irvine, Peter Alliss and Ken Brown among others. And there are plenty of moments to enjoy from Phil Mickelson's record equaling round to Louis Oosthuizen's hole-in-one. Question: Do you believe in the golf gods? Mickelson: "I didn't, but I do now." Phil Mickelson was one missed putt away from setting a new record for the best ever round at a major. However, he still has one record, although that might not be too much comfort for the American at the moment. A day of ups and downs for Scotland's Russell Knox. This though, was definitely the highlight for him. Watch the video below to see him make an eagle at the par-five 16th, much to the delight of the home fans. Sergio Garcia has been the runner-up of the Open on two occasions and his fans will not be too happy to hear that he has followed up his birdie on the 16th, with a bogey on the 17th. He now falls behind playing partner Keegan Bradley after the American made par at the same hole. Eight of the top 11 are American, which is a worrying statistic for any European fan with the Ryder Cup only a few months away. Englishman Andy Sullivan rolled in a birdie putt on 18 to sign for a four-under 67 and go a shot clear of Justin Rose as the day’s leading Englishman. But it was only when he looked up at the Royal Troon leaderboard on 18 that he realised just how well the man in the group in front of him, Phil Mickelson, had been doing. We've still got some big names out on the course, including Sergio Garcia who is currently celebrating after a birdie on the 16th. That is his sixth of the day and his third in five holes. That leaves him on four under, while playing partner Keegan Bradley has also recorded back-to-back birdies and is on the same score overall. What a day of golf it has been so far, but we're not done yet. Last year's champion Zach Johnson has just finished for the day, but his round ends in disappointing fashion as bogeys on both of the last two holes leaves him on four under, four strokes behind Phil Mickelson. Adam Scott, fresh from birdies at the 16th and 17th, ends on two under, with Henrik Stenson, the third man of a top quality three-ball finishing on three under. Well, after a hectic finale for big Phil Mickelson it's time for me to hand over to my colleague Michael Emons, who will guide you through the rest of today's play.